Extensions / Modules / Plugins are the most important part of the CMS development in today’s era. Plugins ease the development efforts of the developers. The best thing about an extension or plugin is that you can include them in any of your site, if you require extra functionality. Over the years, we’ve built dozens of highly customized Add-ons and extensions of several open sources available in the market for both public release and private client projects. As sales increase, we will be developing more and more powerful commercial Add-ons for you to the public. If you are using an open source solution and can’t find an add-on that suits your needs, contact us for a quote about your project need. We want to provide you and your clients the highest quality Add-ons backed up by great support. We have expertise team who implements add-ons and extensions for open source platforms. ExpressionEngine Module Development: W3care is a member of ExpressionEngine professional network since 2011. Our team has 9+ years experience in custom ExpressionEngine plugin development. We have been providing ExpressionEngine Module development services since 2010 and already developed more than a dozen public and Private ExpressionEngine Add-ons. We can be proven your best ExpressionEngine development partner. We have already been outsourced by more than 50 international companies. Expression is very unique and designer friendly CMS. ExpressionEngine Module Development or ExpressionEngine plugin development is one of major service of our development services. Let us know your requirement of ExpressionEngine plugin development for your business need. Joomla plugin Development Services: Joomla plugins or extensions are used to perform various motives. Joomla plugin installation improves usability of website and saves you time and efforts. Joomla plugin development services improve the accessibility and ease the process of development. Joomla plugins are really helpful to handle the quite number of tasks. We have developed and deployed numbers of plugins for many companies to fulfill the need of their website and their client’s websites. If you are looking for Joomla plugin development services for your site then just let us know about your requirements. Magento Extension Development Services: Magento has great feature of extensions (also known as modules) which enable your website to perform extra functionality. We have been providing Magento extension development services since 2010. Magento extensions are really helpful to transform your ecommerce website in influential selling engine. Magento provides eternally customization of Magento plug-ins. Magento extensions were really revolution in Magento ecommerce development services because they are able to launch new functionalities in every circumstances. Share your requirements today with us for Magento extension development services. Drupal Custom Module Development: Drupal is another popular content management framework to build great websites. Without modules, Drupal is like nothing between burger. Thousands of add-on modules have been developed since now. We are proud that we also have developed many add-on modules for clients. We have expert team of developers for Drupal custom module development who deliver the website and add-on modules exactly according to requirements. WordPress Plugin Development Services: WordPress is the most popular CMS out of all CMS available in market. WordPress plugins play vital role in the functionalities of the website. We have more than 8 years experience in WordPress plugin development Services. We have successfully developed dozens of plugins for our clients. Our W3care team makes you sure to deliver a SEO friendly, high quality, easy as pie to integrate plugins and will be compatible with all WordPress versions. Contact us today for WordPress plugin development services. We always provide prioritized support to our add-on customers. 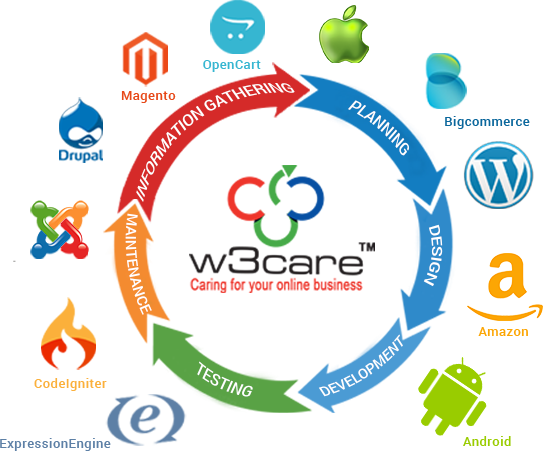 W3care Technologies is process-driven company and only emphasis on client’s satisfaction. We work with passion, transparency, determination, persistence, and technical competency to fulfill your goal. Our team work for unique design with following the standards of development. Our goal is to accomplish project according to agile process model with quality assurance. Our all websites are SEO optimized. We have also assigned team to maintenance and dedicated support. Creative Cycle Inc. was in need of an experienced team of Web Developers who could get the job done with minimum supervision. We found that in the development team at W3Care. We were able to design and plan each component of our websites and leave the hard stuff like getting our ideas to fly to W3Care. They proved to be knowledgeable, insightful, professional and absolutely a pleasure to work with. Thanks guy! Nicole C. Lavine, Managing Director, Creative Cycle Inc.